Thanks to Incentive Travel and Corporate Meetings for covering The Mowbray! 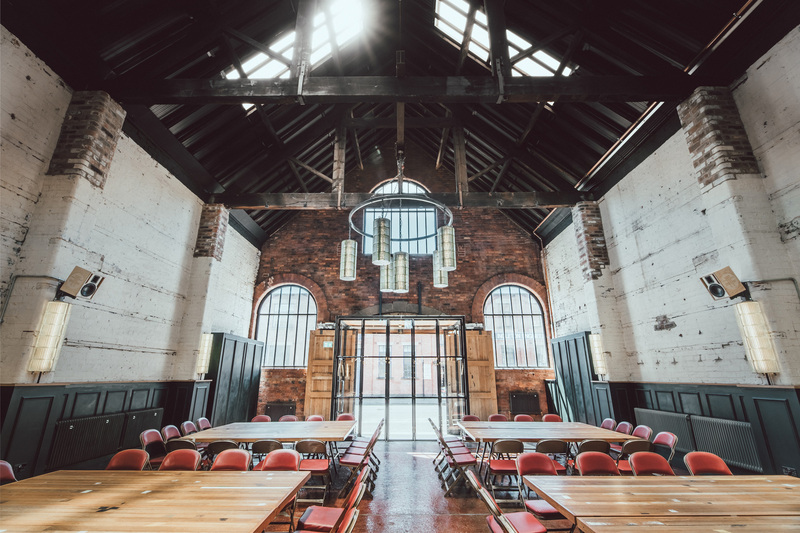 A complete overhaul on a building in Sheffield’s industrial Neepsend area has opened as a new events space, The Mowbray. Located on 118 Mowbray Street the building was originally a steel and iron merchants built in 1889. Opened 5 days ago, The Mowbray is open daily for conferencing, meetings, launches, photoshoots and filming, private dining and weddings. After a 3 year intensive restoration period the building has had a dramatic transformation into a state of the art 180 guest capacity events space with an eight metre bar and commercial kitchen over the ground floor with a herbarium, roof garden and workspace on the first and second floors. Billed as a new concept for professionals seeking design inspiration from their conference and events space and a new style of events space for ‘kindred spirits’ has seen design and interior architecture take centre stage. Multi-award winning Sheffield design studio 93ft, who have recently scooped a National RIBA award and an International FRAME award for their work on Sheffield workspace Jaywing have masterminded the interior architecture and design. 93ft have designed three clearly defined separate spaces and worked an architect’s dream into the scheme by constructing their own studio HQ suspended above part of the events space in a dynamic two level glass pyramid in a private capsule, morphing around the structure of the original buildings. 93ft have worked to join two buildings into one and have not only designed The Mowbray from their studio but have made architectural lighting, furniture and structures for The Mowbray from their workshop on Kelham Island and have used artisans from less than a mile radius to complete the project. Locality, creativity and thought also flows from the kitchen - which is headed up by husband and wife team Emma and Matt Tophill-Reed who are passionately proud to be supporting local, buying seasonal and baking fresh daily. The Kitchen interconnects into the main space or can be completely private allowing guests to be as involved in day to day kitchen life as they’d like to be. The roof garden and herbarium situated on the first floor which is described as a ‘work in grow-gress’ is another collaboration with a Sheffield company Frances & Rose who has grown and transplanted many herbs and plants for The Mowbray from her plot in the Peak District. Working to a list of flora native to the both Kelham Island and Neepsend which was first compiled in the 1960’s the team aim to of bring as much native plant life to the roof garden as possible. The overall aim is to supply the kitchen and bar but to also support the bee and insect life in the area - with great results visible already. The Mowbray is family owned, operated and built on the foundations of experience, creativity and hospitality from almost a decade of owning and running the award winning The Chimney House on Kelham Island, Sheffield.